I think we all make “clean out the fridge” dishes from time to time. Maybe you just got home from a long day at work without having had time to shop, so you make a gourmet dish out of the still-viable carrots, apples, and celery at the bottom of your crisper drawer. Or maybe you’re just determined not to buy more vegetables until you use that last lonely zucchini and the red bell pepper you grew yourself. In my case, some kind of brain cloud had caused me to buy gargantuan quantities of delicate veggies on Thursday when we were leaving on a 10-day vacation on Monday. Crazy. I realized on Sunday that I’d better use it all up or lose it to the compost pile. So I did the best thing you can ever do to eggplants, zucchini, peppers, and mushrooms: I roasted them. I stuck them in my toaster oven without actually knowing what the rest of the meal was going to be just because I knew that everything is better roasted. At the very least, they would be the perfect accompaniment to a simple bean dish. But while they were roasting, I caught sight of our flourishing basil and immediately craved pesto. 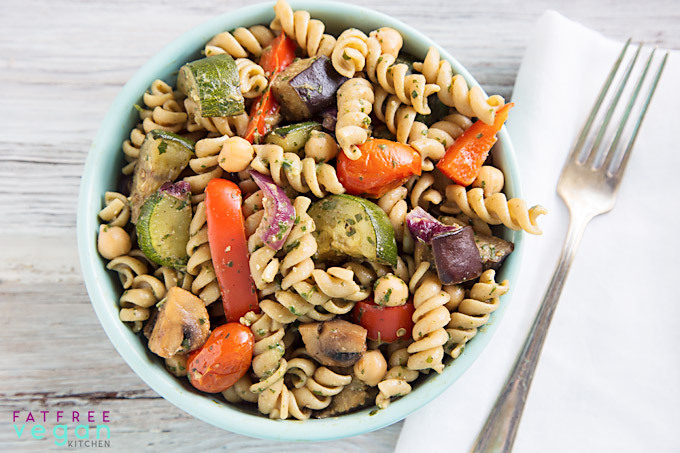 Rather than go to the trouble of making a true pesto, I simply whirled the basil in the food processor with some balsamic vinaigrette, walnuts, and nutritional yeast, poured that over the roasted vegetables and pasta, and added some chickpeas to make it a one-pot meal. 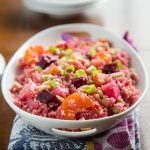 It was one of those spur of the moment, easy, throw-together meals that turned out to be an instant family favorite. Unfortunately, I didn’t take any photos, so I filed the recipe away in my mental recipe box to make again later. Later came this weekend when I needed a dish for a potluck dinner. Everyone in my book group seemed to enjoy this pasta salad, which I dressed up with the addition of Kalamata olives. And because it makes a huge amount, there was plenty to go around. 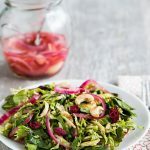 Use any balsamic vinaigrette or Italian dressing that you like; even if if comes from a bottle it will be instantly transformed by the addition of fresh basil and roasted garlic. While the vegetables are cooking, cook the pasta according to package directions. 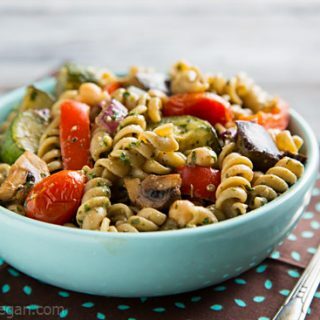 Drain and add pasta to vegetables, along with chickpeas and olives, if desired. Make the dressing: Place the basil in a food processor. Squeeze out 4-6 cloves of roasted garlic (or however many you like) and add it to the food processor, along with walnuts and nutritional yeast, if you’re using them. Pulse 6-8 times to chop the walnuts. Add the vinaigrette and process until smooth. Add dressing to pasta and vegetables, stir well, and season to taste with salt and pepper. Serve at warm, at room temperature, or chilled. If you’re using a toaster oven or other small oven, roast the eggplant and zucchini for about 25 minutes, stirring halfway through; then remove them and roast the peppers, tomatoes, and mushrooms for 10-15 minutes. Without optional ingredients: 320 calories, 23 calories from fat, 2.7g total fat, 0mg cholesterol, 162.1mg sodium, 572.2mg potassium, 67g carbohydrates, 11.8g fiber, 6.8g sugar, 11.5g protein. This post contains an Amazon affiliate link to a product I love. When you buy something through my link, I receive a commission that helps support this site. Thanks for your purchase! Wow!!! Totally lookin forward to trying this- my toddler would be in heaven. Pasta, chickpeas, and tomatoes… Her three favorite food groups. Do you think this would hold up ok in the fridge with the dressing? Or am I better of leaving it separately? 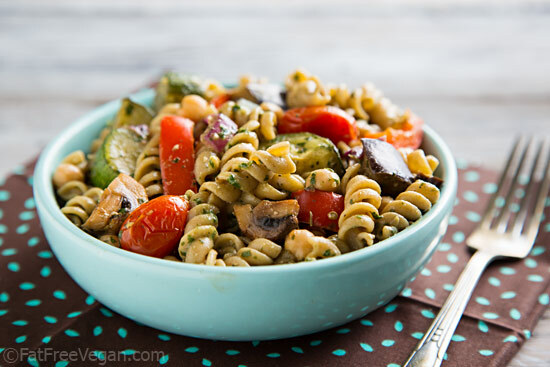 Just received delicious warm pasta salad post in my inbox and have bookmarked it to try very soon. I’m a big fan of clean out the fridge recipes! Thanks so much. I make this dish with my bits of leftover pesto in the freezer all the time. It’s always a hit, no matter what combination of vegetables and pesto flavors I use! What a wonderful way to use roasted veggies! I really like the idea of adding a prepared vinaigrette as part of the pesto dressing. You’ve got me wondering how my lemony pear vinaigrette (cousin to your apple raisin one) would work in something like this. 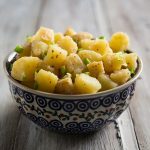 It looks like a really good dish to serve to a crowd, that’s not a lot of fuss, but combines the roasting with an extra dimension of flavor from the pesto vinaigrette. I’m thinking the roasted tomatoes add a nice juiciness. All the veggies in the photo look so moist and scrumptious I wanted to take a bite. Great pictures! I made this tonight. However, I forgot to buy the basil. So, I just hit it with a little cilantro that I had in the refrigerator. Yummy. You are so creative! We aren’t big pasta eaters but it could be good with a hearty whole grain such as barley or faro perhaps. Made this tonight and was delicious. My boys ate it up. I loved it warm, but had a few bits of the leftovers from the fridge and is very tasty cold as well. They asked if they can have the leftovers in their lunch boxes tomorrow. I love quinoa. I often eat quinoa with south indian curries. 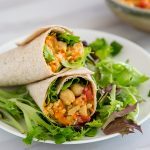 Thanks for posting incredible vegan dishes! This was amazing!!! I made it last night and couldn’t get enough. Had it today for lunch as well. It was just as good cold! I made it tonight. It was really good.I saw the post on Facebook for this recipe this morning. OH, it’s like you looked in my fridge and knew. I told my daughter last night, I have two zucchini’s, half an eggplant, a basket of baby bellas and 1/2 a basket of grape tomatoes that were all at least 2 weeks old. I don’t want to throw them away. The pesto dressing was a little sweet, so I wonder what I can do about that next time.Less raisins? But again, It was really good, will definitely make again. I didn’t add the chickpeas, but did add the kalamata olives.